The below artworks are the most important in Art Informel - that both overview the major ideas of the movement, and highlight the greatest achievements by each artist in Art Informel. Don't forget to visit the artist overview pages of the artists that interest you. 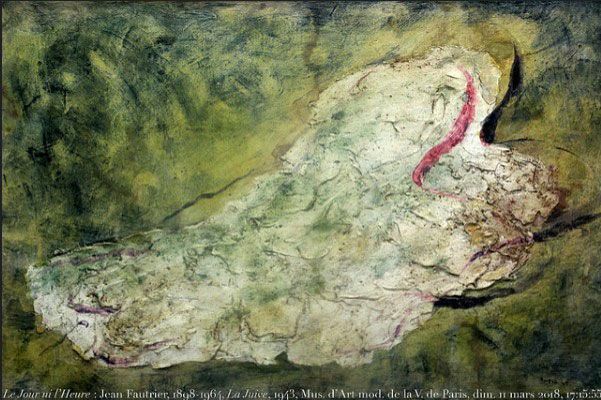 Artwork description & Analysis: Fautrier painted a deeply textured, organic shape, mottled with greens, browns, creams, and pinks that evokes an organic, even humanoid shape, set against a tactile, earthy ground. The crimson s-curve located in the top right barely suggests part of a face or a profile in the process of decomposition. Responding to the Nazi torture of his fellow French comrades, Fautrier hoped to communicate the traumas and existential malaise felt in postwar Europe, and yet the painting's almost jewel-like beauty caused discomfort among viewers. Artwork description & Analysis: This work depicts an energetic vortex of dark calligraphic lines, extending from a void-like center, a kind of swirling nebula of varying shades of brown and yellow. Small globular drops of intense blue, black dots, and squiggles, throng within the form, creating the sense of a small microscopic or molecular world, pulsing with the forces of creation and disintegration. The work reflects the artist's statement: "A tiny sheet of paper can contain the whole world." Stained with varying shades of blue, the edges of the canvas both frame the central image and enhance its buoyant and floating effect. Reflecting the influence of Miro's images of teeming small biomorphic forms, the image also evokes those nebulae, called star nurseries, as new stars form within them. The philosopher Jean-Paul Sartre described Wols as "human and Martian together... He applied himself to seeing the Earth with inhuman eyes: it is, he thinks, the only way of universalizing our experience." Wols created his own pictorial idiom by using paint in innovative and untraditional ways, including, as art curator Toby Kamps described, "thin glazes of color, scablike impastos, splashed and poured pigment, steered rivulets of liquid paint, scraped-down margins, back-of-the-brush scratching and writing, even marks made with the circular mouths of paint tubes." Often likened to Jackson Pollock, Wols' paintings were smaller and more controlled than Pollock's drip paintings. Interned in a camp in Provence in 1939 and escaping in 1940, Wols used his early training at the Bauhaus and with the Surrealists to create his Zirkus Wols, as he called them, while he was in hiding from the Nazis. These unstructured intuitive watercolors relied on randomness and spontaneity and deeply informed his later oil paintings. His work was driven by a belief in the abstract, as he wrote in his Aphorisms (1944), "Nothing can be explained, all we know is the appearances... The Abstract that permeates all things is ungraspable. In every moment, in everything, eternity is present." His work profoundly influenced Tapié's concept of Art Informel, as he wrote, "an entire system of certainty has collapsed" and needed to be replaced by a "fertile and intoxicating anarchy." Artwork description & Analysis: A Portuguese artist who spent considerable time in Paris in the 1930s and, after fleeing Europe to Brazil, returned to the city in the late 1940s, Maria Helena Vieira da Silva quickly made a name for herself among the Lyrical Abstractionists. Her distorted, warped, and fractured geometries suggest architectural interiors that create a kind of claustrophobic vertigo. While her compositions are more linear and at times more geometric than many Lyrical Abstractionists, she shared their subject matter - the trauma and devastation of World War II. The entire surface appears to be covered in small shimmering tiles, except for the structural beams along the edge of the ceiling. Diagonal lines intersect the opaque geometric tiles, giving them an effect of shattered glass. The conflicting shapes created by the contrasting black, grey, and white color palette enhances the effect, as perspective becomes fluid, shifting ambiguously, creating an anguished perception of space. As a result, the work evokes internal space, of a mind caught in a state of anxiety. As art historian Martha Meskimmon recalled, "As her admiring critics from the 1960s and 1970s would have it, her fascinating 'hypothetical geographies' were 'mysterious horizons,' 'vistas that exist nowhere but have become real because Vieira da Silva has brought them into being.'" Like Wols, Vieira da Silva made unseen, interior, abstract worlds real and palpable. Though iconoclastic, her intricate and spiky compositions were a unique contribution to Art Informel and made her a leading artist of the movement, as this work was shown internationally in 1950, where it also attracted the attention of the American Abstraction Expressionists. Artwork description & Analysis: Against a black background, white and red calligraphic lines burst outward from an off-center point and energetically extend across the canvas. The clustered lines, creating a matrix of horizontal and vertical movement, suggest a burst of graffiti, erupting from a spontaneous gesture. The flow of the piece is intuitive, as the few thin lines, scrolling into the relatively vacant left side of the canvas, become curvilinear and seems to resolve into a graceful energy. This work exemplifies Mathieu's calligraphic approach, as well as his emphasis on rapid execution as a way to connect with immediate intuitive expression. Around 1954, he began creating performances where he painted large canvases quickly in front of an audience, a kind of precursor of Yves Klein's later performative painting. Mathieu pioneered Lyrical Abstraction and became one of the most famous and successful painters in France both among critics and the general public. In 1960, Clement Greenberg considered "him the strongest of all new European painters," and Mathieu's cultural currency was reflected in the psychedelic documentary made of his life, Georges Mathieu, or the Fury of Being (1974). However, subsequently, his work fell out of favor for two decades, before interest was revived by his 2002 Paris retrospective and his inclusion in the Guggenheim's Art of Another Kind: International Abstraction and the Guggenheim, 1949-1960 in 2012. Artwork description & Analysis: Riopelle's work employs thick patches of color, slashed by the incised lines made by a palette knife, creating an almost stained glass effect or evoking a window that has been shattered into small pieces. A multitude of intersecting diagonals turn the often pure pigments into shards, while the thick, almost oily, surface, exaggerates "the sensual materialism of painting," as art critic Ken Johnson noted. Working paint applied straight from the tube with a palette knife, Riopelle's artistic process, his physical engagement with the medium, made him a leading figure among the Lyrical Abstractionists. Montreal born and raised, Riopelle spearheaded the Refus Global (Total Refusal), a Quebec movement and manifesto that rejected the political, religious, and artistic establishments. Rejecting academic training, the group advocated for abstract painting, driven by intuition and the subconscious. He went to Paris in 1945 where he met Tapié and Mathieu, who exhibited his works in the 1947 L'imaginaire exhibition. Known as the "bad boy" of the Art Informel circle, due to his tumultuous lifestyle that included being a noted racecar driver, he became internationally renowned when he represented Canada at the Venice Biennale in 1954. That same year he met Joan Mitchell, who had recently moved to Paris, and the two became longtime lovers and partners. Known as Canada's leading abstract painter, he also played a notable role in creating links between American and European abstraction. Artwork description & Analysis: In this innovative work, Burri sewed together irregularly shaped patches of burlap to replace the traditional canvas. The prominent and rough stitches, sometimes erupting in a snarl of thread, combined with the small droplets of blood-like bright red paint convey a sense of bodily injury and repair. The bit of gold leaf in the top right corner does not so much suggest the shimmer of gold as the remnant of a stain, and the sense of ruin is further echoed in the chopped edges and small burnt areas. Burri was a doctor in the Italian fascist army when he was captured by the British in 1943 and sent to a prisoner of war camp in Texas. There he turned to painting, making canvases out of burlap sacks attached to stretchers. When he went home to Italy in 1946, he gave up his medical profession and devoted himself to art, making a series of collage constructions he called Sacchi (Sacks), of which this piece is a notable example. As art historian Jennifer Blessing writes, "His use of the humble bags may be seen as a declaration of the inherent beauty of natural, ephemeral materials, in contradistinction to traditional 'high' art mediums, which are respected for their ostentation and permanence." Some have argued that Burri's use of stitched burlap comes from his practice as a physician, but Burri suggested that it was simply the material he had at hand, saying, "If I don't have one material, I use another. It is all the same. I choose to use poor materials to prove that they could still be useful. The poorness of a medium is not a symbol: it is a device for painting." While he bristled at labels, Burri's work was exhibited as a notable example of Art Informel, and his works were viewed as innovative embodiments of materia, or Matter art, even if Burri insisted on the cooler values of composition and construction, as seen in this work's generic title. His work was a primary influence upon the subsequent development of Arte Povera. Artwork description & Analysis: Appel used intense color, thickly applied paint, and heavy black outlines to depict the child-like rendering of a crocodile, standing on its hind legs, holding a sphere. Rejecting traditional modeling or perspectival illusion, Appel looked to childrens' drawings, the art of the mentally ill, and folk art to create an emotional intensity he felt was lacking in more recent art making. As with much Art Informel, Kappel's handling of paint suggests dramatic spontaneity that signals the rawness of emotion and feeling. Born and raised in Amsterdam, Appel was first associated with the Dutch Experimental Group and, subsequently in 1948, became a cofounding member of CoBrA, a movement inspired by nontraditional art forms. While his work retained figurative elements with aggressively distorted animals and human figures, evoking subconscious archetypes, the dynamic materiality of his painting led Tapié, after meeting Appel in 1950, to include his work in the Un art autre exhibition and to subsequently arrange several solo exhibitions. As art critic Christopher Masters wrote, "it was the quality of the oil on canvas - vivid, viscous and roughly textured - that made Appel so distinctive." Appel said of his work, "I never try to make a painting; it is a howl, it is naked, it is like a child, it is a caged tiger ... My tube is like a rocket writing its own space." Artwork description & Analysis: In Untitled, irregular blobs of acidic-colored pigment, applied in varying thicknesses and incised with dark lines, coalesce to create the contours of a human figure and a bird that eerily emerge from the background but yet remain bound to it, "scarcely distinguishable as representational forms," as art historian Lucy Flint notes. In the lower third of the canvas, other faces - distorted and demonic - appear, vanish, and reappear, blurring into one another and the background, as if the viewer, caught in a fantasy or a nightmare, were imagining them wherever dots resembling eyes or a line resembling a mouth appear. Beginning around 1948, influenced by Dubuffet and Paul Klee's works, Jorn created images containing a crowd of vaporous figures and faces that, materializing and dematerializing in amorphous shapes of color, were not unrelated to the Surrealists' experimentation with automatic drawing and that embodied the horrors and angst that filled Europeans after the War. Like other CoBrA artists, Jorn, according to art critic David Ebony, "emphasized pure intuition, spontaneity, and the role of chance, as they called it 'desire unbound.'" A leading figure of what would come to be called tachiste painting, Jorn's work also presaged the later Neo-Expressionists, including German Georg Baselitz and American Julian Schnabel. Artwork description & Analysis: The rough and coarse surface of this painting and its irregular forms, grains, and striations, resemble a close-up of the earth as seen from space or a microscopic cross section of mineral deposits, and yet the association, evoked in the viewer's mind and further prompted by the title, is countered by the work's abstraction, its emphasis on sheer texture and materiality. A relentless innovator, Dubuffet here used crumpled up aluminum foil to build up layers and topographies. The artist said, "Perhaps I'm not alone in loving the ground." Soul of the Underground conjures both the destructive effects of the war and the dirt and stones that, remaining, could be put to new uses, including the creation of a new art. While Dubuffet had an enormous influence on Michel Tapié, Dubuffet's immediate postwar work was figurative and primarily associated with Art Brut, his movement that emphasized the "raw art" of children and the mentally ill, as he said, "I have a great interest in madness, and I am convinced art has much to do with madness." 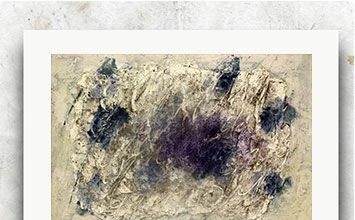 By the 1950s, as he worked on his Texturologies series, of which this work is a part, he was inspired by Jean Fautrier's earlier surface textures to abandon pictorial representation in favor of formlessness and matiérisme. Dubuffet was among the most celebrated and influential artists of his era, and influenced the likes of Helen Frankenthaler, Georg Baselitz and, later, Anselm Kiefer and Robert Morris.